If you love Stone Axe and their prolific II album from 2010, you're going to dig the 'deluxe edition'. The classic rock band from Washington state, for whom the Seventies never ended, revisit their melodic heavy, sometimes stoner, sometimes bluesy, album and give you more. Above, Stone Axe: classic rockers, outdoors. This two disc set includes the original II set list. Not much to say here. Excellent tunes like We Know It's Still Rock 'N' Roll, Chasing Dragons, or Turned to Stone, by example, are not to be missed. But you knew that. 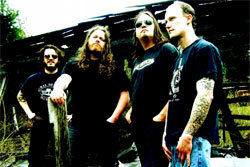 Notable is the the Cream cover, SWLABR, and Black Widow from the band's earliest days. The live tracks are interesting, but only Taking Me Home actually 'sounds' live. Frankly, they seem to clean to be live. You would expect some more gritty from a classic rock band. But that observation is probably trivial. Why? Stone Axe is an American analomy, maybe a treasure: resurrecting and revitalizing the best of classic Seventies rock in a modern context. They do it right and do it well. Fans should scoop this up, and newcomers, too. Recommended. This 'deluxe edition' of Stone Axe's II album offer the original album plus a second CD with material from the vinyl, some live tracks, and more. 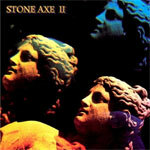 If you don't know Stone Axe, one of the great classic rock bands in the modern era, than you should get this album.